Crossing the boundaries from Cyberpunk Fiction to Reality, Stelarc’s work moves gradually towards the realization of a vision: To investigate the interface between the actual and the virtual world, with the body acting seamlessly in mixed realities, and with an intelligent avatar that performs in the real world, with optical density and tactile experience. This idea, seems to permeate his experimentations with engineering, robotic and digital technology, and with artificial intelligence and biotechnology – from the Third Hand, Ping Body and Parasite, to the Exoskeleton. The Prosthetic Head has been engineered into a robotic version, which is the Articulated Head that gives a “physical and sculptural embodiment” to it. The delineated possibilities are well promising. In the Cyberpunk science fiction novel Neuromancer (2) by William Gibson (3), the imaginary persons have the possibility of being physically tele-transported, from the Real World to Matrix (Cyberspace), a virtual space, technologically created. In 1990, six years after the first edition of Neuromancer, Cyberspace passed from the realm of Science Fiction to Reality, with the invention of World Wide Web by Tim Berners-Lee (4), who developed ARPANET (5), a 1969 application that was intended for military use and created the Medium that would determine the course of Post-Industrial Culture (6), introducing the planetary networking in real time, with a global net of personal computers. Five years later (1995), the vision for sensory interactions of the physical body with cyberspace passed from Science Fiction to the Reality through art. 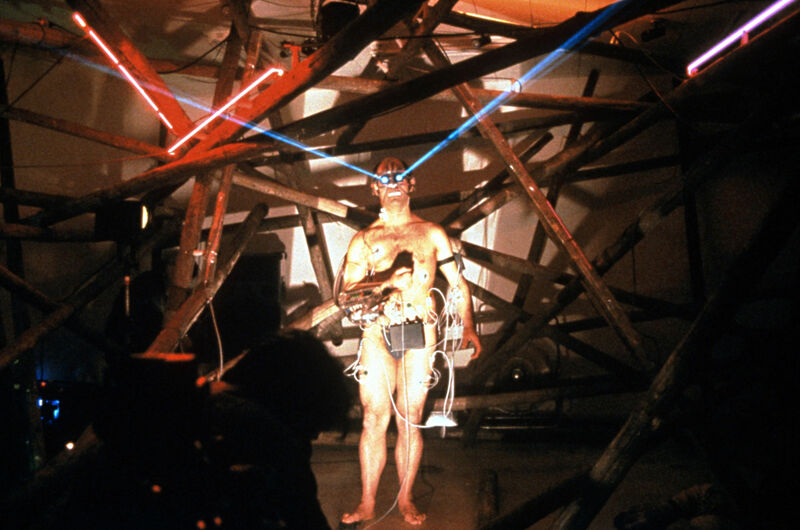 The Aurstalian performer of Cypriot origins, Stelarc (Stelios Arcadiou) (7) achieved sensory interface between the body and the Internet, within the framework of his investigations for alternative and involuntary interactions, between the human body and the smart machine. Between 1995 and 1998, he created the performances Ping Body (November 1995) and Parasite for Invaded and Involuntary Body (1997, Ars Electronica Festival). Bearing in mind the above developments, I organized a two-day event entitled “From Science Fiction to Reality”(10) at the Hellenic American Union of Athens in April 2007. Guests were Stelarc and Bruce Sterling (11), a Science Fiction author and a leader of cyberpunk culture since 1982, who – along with William Gibson – formed the first cyberpunk literature cycle. The discussion was moderated by Prof. Michalis Meimaris (12). The media he uses to propose in practice are alternative anatomical architectures for the physical body, applications of engineering, robotics, digital technology, artificial intelligence and biotechnology. For some of his projects, he notes that they are under construction, leaving open the possibility they may develop further, towards directions that he plans to realize later. But what’s interesting for me is not simply going more and more virtual but rather exploring the interface between the actual and the virtual. I’m trying to investigate whether a physical body can function in a virtual immersive environment and whether an intelligent avatar might be able to perform in the real world by possessing a physical body. (author’s translation) (16). It was in 2005, when I was planning the international group art show “In Vivo-In Vitro” (17) in the art hall “Factory” at Athen’s School of Fine Arts; in a communication with Stelarc for his participation, he had proposed the video document from the process of the creation of the Extra Ear – ¼ Scale be placed next to interactive video installation of the Prosthetic Head. An automated, animated and reasonably informed artificial head that speaks to the person who interrogates it. The Prosthetic Head project is a 3D avatar head (19), somewhat resembling the artist that has real time lip-synching, speech synthesis and facial expressions. Head nods, head tilts and head turns as well as changing eye gaze contribute to the personality of the agent and the non-verbal cues it can provide. It is a conversational system which can be said to be only as intelligent as the person who is interrogating it. This Avatar is an ALICE (Artificial Linguistic Internet Computer Entity), a conversational system that interacts and derives answers from an enriched data base. The Extra Ear – ¼ Scale (20) is a 1/4 scale replica of artist’s ear, grown using human cells in a rotating micro-gravity bioreactor, in collaboration with Oron Catts and Ionat Zurr of Tissue Culture & Art. This is a technique used to detect in order to realize the later Ear on Arm (21). Might an interactive semi-living sculpture be created by the coexistence of an artificial intelligence (AI) that acts on the Internet and a robot that acts in the physical space, having as a shell skin that “feels”? 1) Is it possible to create optical density and tactile experience in performance with Avatar? 2) Could the body act seamlessly in Mixed Reality, with mechanical and virtual systems? For the present chapter, I am based on the comparative study of his selected works. The selection was made on the grounds of redesigning and extending the physical body, on the one hand, by using robotics and biotechnology for the members of the body, on the other hand, by using artificial intelligence and digital technology for the verbal interaction between human and intelligent machine. Along the way, it seemed that Stelarc’s seemingly disconnected projects are closely related and then, like links in the same chain of reasoning lead to the idea of interactive symbiosis of the physical body with its prostheses and its extensions, in the Mixed Reality. On the one hand, the extension of the able-bodied physical body with robotic prosthetics and its evolution in system of body και attached machine in the real space begins with the Third Hand (22), a mechanical human-like hand that is attached to the artist’s right arm as an additional hand and culminates with the Exoskeleton (23), a six-legged, pneumatically powered walking machine, constructed for the body. It is a “partial portrait” of the artist, in a life-support system (bioreactor/incubator). The PH was contaminated after one week, and was preserved in formaldehyde for the remaining time of the exhibition. The Prosthetic Head acquired its robotic “body” in real space, when the Articulated Head was created. This artificial intelligence that would become “increasingly autonomous and unpredictable” I realized that was materialized in the Prosthetic Head that he set out in 2003 the same year that he presented the Movatar. Moreover, in the performance with the Movatar, we find that the avatar – a technological entity of virtual reality that is linked with electrodes on the performer’s body – controls it, thus obtaining this optical density and tactile experience in real space. A conversational system which can be said to be only as intelligent as the person who is interrogating it. There is an attempt to make the Prosthetic Head more creative in its responses. It has embedded algorithms that enable it to generate novel poetry and singing each time it is asked. It would be interesting if at a later stage could Prosthetic Head, Movatar, and performer’s body be combined in the same interactive net in order to accomplish the vision for an Artificial Life that act in the real world through physical body. It is worth noting that the Articulated Head project is part of a wider “Thinking Head Project”, funded by the Australian Research Council (ARC) and the Australian National Health and Medical Research Council (NH&MRC) between 2006 and 2011 (37). The Articulated Head project indicates the way to body’s perspective to act seamlessly in Mixed Reality, with mechanical and virtual systems. A prerequisite is body’s connection with the Articulated Head and Prosthetic Head system. At this point it should be recalled the methods used by Stelarc, for connecting the body to the virtual reality in Ping Body, Parasite for Invaded and Involuntary Body and Movatar. In 2015, Stelarc had already made performance entitled Body on Robot Arm, wherein his body attached on the robotic arm is allowed to pivot in all directions, being still under developers’ watchful supervision, since in that phase there were serious safety issues, if the body is connected with muscles and its motor control is left with this robot (38). Apart from issues on the operation and expansion of the Articulated Head, at this point the issue of its form, its nature and the limits of its interfaces arises. Apart from the view of connecting the body with the Robot-Artificial Life system, let us consider, with the reductio ad absurdum, the hypothesis of the cohabitation of an intelligent robotic system with living biological material: If we could build alive biological shell (artificial skin) from cultured cells for a robot (Articulated Head) connected with artificial life (Prosthetic Head), then we would have got a semi living avatar with visual optical density and tactile experience to act seamlessly in Mixed Reality. Stelarc worked with them to create the Extra Ear – ¼ Scale, which was launched in 2003. We should bear in mind that Biotechnology is also used in the creation of both Partial Head and Ear on Arm (awarded the Golden Nica, Hybrid Art category, Ars Electronica, 2010), which is a soft prosthesis from his own cultured tissue in the form of ear and which was incorporated surgically in his left forearm. So far, a semi living sculpture that is created with the aid of Biotechnology can only survive in special circumstances and for a limited period of time, unless it is transplanted into a histocompatible physical body. The cultured tissue cannot remain alive indefinitely and autonomously, outside the device that provides the necessary conditions, nutrients, and protection from infections that would lead to its death in the natural environment. Therefore, the hypothesis of creating of a living biological shell for robot remains only the prospect of the use of synthetic skin, a material to which Stelarc referred in his early writings on Absent Bodies. More specifically, in the 6th paragraph entitled The Shedding Skin, related to the prospect for the survival of the physical body in the Space, outside planet earth, he notes – with capital letters – that a “hollow body” would be a better host for the technological components that would consist of (41). As far as the creation of Artificial Skin for an avatar that has optical density and tactile experience act seamlessly in Mixed Reality, we would have to move our expectations from Biotechnology to Nanotechnology. Scientific research into Synthetic Skin has resulted in a number of very interesting proposals. Indicatively: in 2010, a publication in Nature Materials presented the results of two research teams of Berkeley that created artificial skin that “feels” by using Nanotechnology (43). In 2014, there was published research into various techniques that are internationally used by research groups in applications of artificial skin that “feels” (44). Finally, in 2015, in Scientific American there was published an article on artificial skin that can send touch signals by using sensors in nerve cells, so that whoever bears the prosthetic member with synthetic leather coating can perceive external stimuli (45). But who can overlook that if the future of Humanity in Space shows promising nowadays, this is due to par excellence transdisciplinary collaborations among visionaries from the fields of Science, Philosophy, Art and Technology, be forwarded in support of the famous quote by Albert Einstein: “The true sign of intelligence is not knowledge but imagination”?